Published: Oct. 17, 2016 at 12:07 a.m. The waiver wire is one of the most important keys to finding success in fantasy football. I'll do my best to help you manage it and find the players who can bring you fantasy glory each and every week. If you play in a deeper, more competitive league, and all 19 of these players are already owned, be sure to check out my weekly "Deep Dive" waiver wire column (published Mondays) for some high-upside players to aim for heading into Week 6. And for those who use the Free Agent Acquisition Budget (FAAB) system, I provide a suggested spend for each player at the end of their analysis. If you have more specific FAAB questions, hit me up on Twitter. 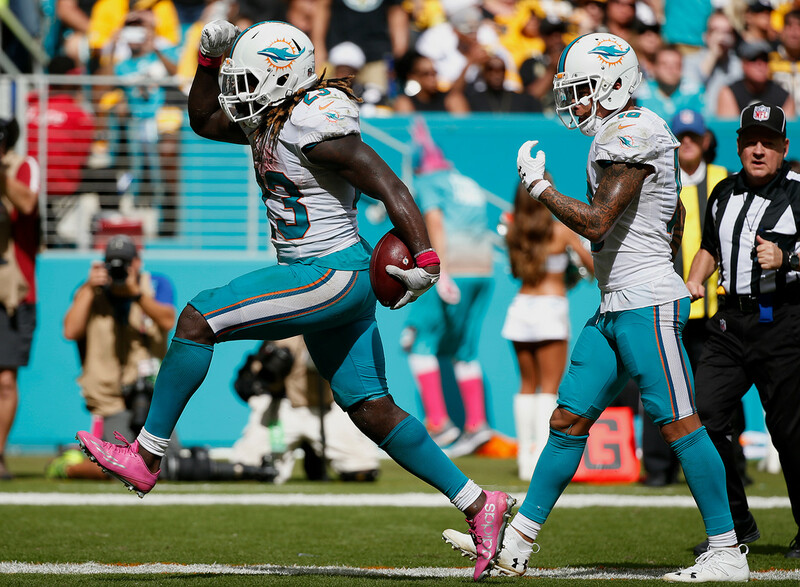 Arian Foster was finally active again, which many thought would spell the end of Ajayi's fantasy value. My word we were wrong. Foster saw just 11 snaps and five touches to Ajayi's 47 and 26 ... which he turned into 207 total yards and two touchdowns. Foster's early-season stranglehold on this backfield is a distant memory, and Ajayi looks like the back many fantasy owners drafted in the mid-rounds this summer. Ajayi ran decisively, breaking tackles and showing breakaway speed as well. He's certainly earned a healthy share of the backfield touches in Miami moving forward. If he's for some reason still available, make him a top priority this week. FAAB suggestion: 25-30 percent. Jamaal Charles was back for the Chiefs and found the end zone against the Raiders, but the team made it clear Ware is the feature back while Charles gets his legs back under him. Ware out-touched Charles 26-11, and outgained him 163-47 thanks in part to playing on 40 snaps compared to Charles' 15. This split should even out in the future, but Ware isn't going away in this backfield and might be the more valuable fantasy back for the rest of the season. If Ware's owner made the mistake of cutting him loose in the wake of Charles' return (as several thousand owners in NFL.com leagues did), make them pay and add Ware immediately. Up next for Ware and the Chiefs is a date with a Saints defense that has allowed a league-high 11 rushing touchdowns this season. FAAB suggestion: 25-30 percent. Powell hasn't played yet in Week 6, but he enters his matchup with the Cardinals having outproduced Matt Forte over the last three games. Powell is especially making a difference in the passing game, with 23 targets and 18 catches in that same span. With Forte getting banged up and slowing down after a massive workload to start the season, expect Powell's role to at worst stay the same, if not increase in the coming weeks. FAAB suggestion: 5-10 percent. For the second consecutive week White led the Patriots backfield in playing time over LeGarrette Blount (61 percent to 39 percent). This time around he found the end zone twice, pushing him into the top 10 scorers among running backs for Week 6. However, as was the case last week White will be a volatile week-to-week play moving forward. Next week's road trip to face the Steelers did have the look of a White game prior to Ben Roethlisberger's injury news. If the Steelers backup quarterbacks cannot keep the game close, we will see more Blount. White is close to a weekly play in PPR formats, but will be matchup-dependent in standard. FAAB suggestion: 10-15 percent. Even though he only played on 15 snaps in Week 6, it is clear Booker's role is growing in the Denver offense. He probably would have seen the field more had the Broncos not fallen so far behind so early, too. He's averaged more yards per carry over the last two weeks than C.J. Anderson (6.3 to 3.7), and is proving to be a strong pass-catching threat as well (six catches, 43 yards over the last two weeks). While Anderson remains the lead back, this looks like it will turn into a committee sooner rather than later. Grab Booker now before we see his role grow even more in a nationally televised game next week on Monday Night Football. FAAB suggestion: 15-20 percent. While the Lions signed Justin Forsett last week, at least for now it looks as if the answer to their running back woes was on the roster all along. Zenner ran hard in the Lions' 31-28 win over the rams, taking his 14 carries for 58 yards (4.14 ypc) while catching both of his targets for 19 yards. Dwayne Washington could return soon too and would likely poach some (if not all) of Zenner's touches, but there's no telling what's going to happen at this point. The Lions offense continues to move the ball well and will have plenty of scoring opportunities, making whatever running back is starting for them a viable option in fantasy. FAAB suggestion: 5-10 percent. For weeks I've been noting Britt's consistent performance for the Rams, and how his touchdown drought was likely to end soon. Well, it ended in spectacular fashion in Week 6 as Britt found the end zone twice against the Lions (and was inches away from a third trip) while racking up 136 yards on seven catches (eight targets). He's clearly the No. 1 wideout for the Rams, despite still trailing Tavon Austin in targets. Britt is a weekly start in PPR formats with four catches and 67-plus yards in five of six games. Those in standard formats might want to play the matchups a bit when it comes to starting Britt, though. FAAB suggestion: 5-10 percent. It amazes me that Pryor isn't owned in more NFL.com leagues (and yes, I know he's probably owned in your league, so save your fingers the extra work in the comments). However, if Pryor is available, correct that as soon as possible. He averages over 10 targets per game since Corey Coleman broke his hand after Week 2, and Pryor has found the end zone three times in those four games. He's the most talented player on the Browns offense and Hue Jackson will continue to feature him until Coleman returns, and likely after still. Pryor will be a solid flex play next week against the Bengals. FAAB suggestion: 10-15 percent. Thomas leads the Saints in targets over their last three games and has found the end zone in each contest after posting a 4-71-1 line against the Panthers in Week 6. Starting the right Saints wide receiver in the right week is a difficult proposition, but Thomas' role seems to be growing and his consistency shouldn't be ignored. With the Saints defense continually putting the offense into pass-heavy game scripts, Thomas' arrow is firmly pointing upward. FAAB Suggestion: 5-10 percent. With Steve Smith on the shelf with an ankle injury, the team hinted that Wallace could see an expanded role and that bore out against the Giants as he led the team with 97 receiving yards on nine targets (second-most on the team). This increased usage comes at a perfect time for fantasy as Wallace and the Ravens travel to play the New York Jets next week. The Jets cornerbacks have made a habit of letting receivers run free in the deep portion of the field, as they've allowed at least one 40-plus yard reception in each game so far this season (prior to Monday Night Football). If Wallace is still available in your league, scoop him up and hope for a massive outing. FAAB suggestion: 5-10 percent. Having Colin Kaepernick under center was a breath of fresh air for Smith, who saw as many targets in Week 6 as he did the past three weeks combined. If Kaepernick starts again in Week 7 against the Buccaneers (no guarantee based on Chip Kelly's postgame press conference), Smith could be worth playing in the flex. The Buccaneers allow 8.4 yards per pass attempt and have a nine-to-three TD-INT ratio so far in 2016. That could set up Kap and Smith for a few big connections. Of course, if Blaine Gabbert regains the starting job, ignore everything I just wrote. FAAB Suggestion: 0-5 percent. Proving he's not a one-game wonder, Cameron Meredith built on his impressive Week 5 performance by leading the Bears in targets (15), catches (11) and receiving yards (113) in a Week 6 loss to the Jaguars. With Eddie Royal suffering yet another injury (a toe this time) and the Bears playing on a short week (at Green Bay on Thursday), Meredith could be in line for a ton of volume, not only in Week 7 but the rest of the season. He's worth an add this week and could be a fine start against the Packers. FAAB suggestion: 10 percent. With Eddie Lacy nursing an ankle injury and James Starks out, the Packers featured Montgomery in the backfield on 22 of his 33 snaps. From that spot, Montgomery was a chain-moving difference maker for the Packers' struggling offense, catching six passes for 52 yards from the backfield (he had 4-46 as a traditional wide receiver). With the Packers having to turn around and play on Thursday and Lacy still not looking healthy, Montgomery could see even more work as a WR-RB hybrid. He could also get more run as a straight wide receiver with Davante Adams potentially suffering a concussion. This offense badly needed a spark and Montgomery provided that. Don't be surprised if they go back to him more often. FAAB suggestion: 5-10 percent. Remember that trend where rookie tight ends never do anything in fantasy? Yeah, Henry is doing everything he can to blow up that narrative. With Gates still working his way back from injury, Henry outperformed the veteran in every statistical category the last two weeks. The rookie has also found the end zone in three straight games. He's a physical mismatch for most defensive backs and doesn't look like he'll be fading out of this offense even after Gates returns to full health. He's a TE1 and weekly fantasy starter until further notice and has a great matchup versus the Falcons up next. FAAB Suggestion: 10 percent. With Dwayne Allen suffering an ankle injury in the first quarter of Sunday Night Football, we finally have some tight end clarity in Indy. Not that we wanted it to come via injury, but with Allen potentially sidelined next week Doyle becomes a borderline TE1 against the Titans. Heading into Week 6, Luck targeted his tight ends on 21.5 percent of his throws. That type of volume will give Doyle an excellent ceiling while Allen recovers. Of course, if Allen plays next week, Doyle's outlook becomes cloudy once again. FAAB suggestion: 5-10 percent. We weren't sure if Davis or Niles Paul would assume a bigger role with Jordan Reed sidelined, but if Week 6 is any indication the team is going to defer to the veteran. Davis played 65 snaps to Paul's 19, and took his four targets for 50 yards and a touchdown. If Reed's concussion keeps him out longer, Davis will have low-end TE1 appeal the rest of the way as he's attached to an efficient, high-scoring offense. FAAB suggestion: 0-5 percent. Adam Rank coined the term "Doyle Rules" for tight ends scoring against the Lions, and this week Kendricks brought the trend back after Zach Ertz let us down a week ago. Next up for Kendricks is a matchup with another defense that struggles to cover the position in the New York Giants. The Giants allow just under 10 targets per game to tight ends, while Kendricks is seeing over five per game in the low-volume Rams passing attack. Those looking to stream the position could do worse than Kendricks, who's coming off a strong 5-34-1 performance in Week 6. FAAB suggestion: 0-5 percent. Smith disappointed as a streamer in Week 6 against the Raiders, but that's because his pass to Dontari Poe was ruled a lateral/rushing touchdown, and the Raiders didn't hold up their end of the scoring bargain. However, there's no reason to not go back to the well with Smith in Week 7 when the Saints and their Swiss-cheese secondary come to Kansas City. If you picked up Smith this past week and have question marks at quarterback (for instance, Aaron Rodgers), Smith might be worth another start. He also has a favorable schedule on the horizon with games against the Colts, Panthers, and Buccaneers in the next month. FAAB suggestion: 5-10 percent. If you watched the 49ers-Bills game, you know Kaepernick isn't the long-term answer at quarterback for San Francisco. However, none of that matters in fantasy when in a bad spot Kaepernick still manages to put up over 18 fantasy points, as he did against the Bills. Next week (if he keeps the starting job) he'll face the Buccaneers in San Francisco. Kap's big-play nature and ability as a runner (66 yards in Week 6) will give him both a solid floor and high-ceiling. Those playing in deeper leagues or daily formats might want to give Kap a look this week on waivers. FAAB suggestion: 0-5 percent.